Worldwide icon-chevron-right North America icon-chevron-right United States icon-chevron-right Illinois icon-chevron-right Chicago icon-chevron-right Can Occupy Chicago survive the winter? 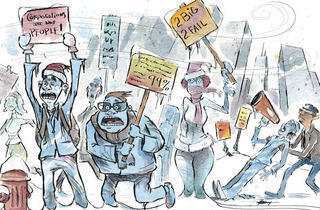 Protesters fighting corporate greed anticipate a season of bitter cold. Last week, Occupy Chicago endured what could’ve been one of the most significant setbacks yet to its round-the-clock presence in front of the Chicago Federal Reserve. It wasn’t the police, despite arrests of 175 protesters in Grant Park on October 16, as well as the cops’ periodic enforcement of an ordinance preventing demonstrators from storing supplies on the public way. No, the oppressive force was Mother Nature. “Neither rain, nor snow, nor sleet will end our occupation,” @OccupyChicago tweeted last week. “We’re chicagoans, weather doesn’t effect us!” But the inclement conditions and the arrests spurred organizers to start seriously discussing at the twice-daily general assemblies the lack of a permanent tent-city home and plans for winterizing the occupation. 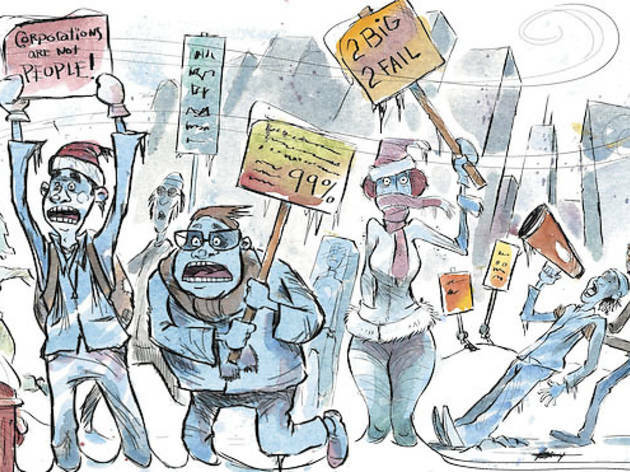 Plenty of protests have survived nasty Chicago winters, Gellman notes. Albert Parsons, who would become one of the Haymarket martyrs, and other local socialists demonstrated on behalf of the unemployed throughout the winter of 1875. In the depths of the Depression, hunger, anti-eviction and Unemployment Council marches occurred during the winter months.